Contemplation - it is a way to ensure that the restoreits internal forces and to pull away from the bustle. Admiring nature in all its manifestations - be it a leaf, a blade of grass or a small stone, we fall into a kind of trance, delving into his "I" without reference to current events. Perhaps that is why there is a mass "exodus" of citizens away from noisy habitats closer to Mother Nature, where its even very tiny piece of land, you can sit down and relax. How to create an atmosphere disposing to rest in his garden? There is nothing easier! Instead of two or three beds with potatoes and tomatoes break at his dacha small pond - now you will have more time to rest and contemplation of the surface of the water - and it is known to be the best cure for stress and loss of strength. Do you think that such a complex hydraulic structures you can not afford? With our tips you will be "reckless", not to mention the small pond, bookmark which you may well be able to master yourself. How to start the creation of a pond? So you realized that your life is more inconceivablewithout sweet lakes, designed to please your eyes and soothe the nerves. 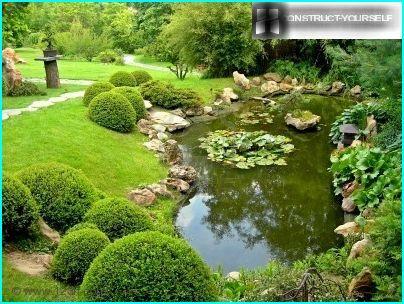 How to create a pond in the country with their own hands, so that it perfectly complemented the landscape garden and has existed for a long time and did not become a problem area that requires tireless care? Let's start with the choice of style and the selection of pondDesignated's bookmarks. Then, we will tell you how to properly do technologically pond and equip it. 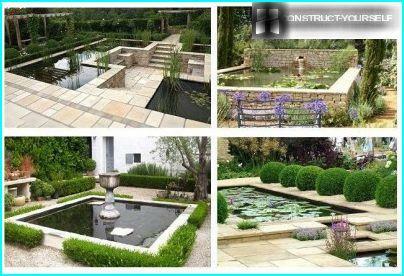 Selected in the right style and laid in accordance with all the intricacies of an artificial pond will be a real gem of your garden and a great place for relaxation. 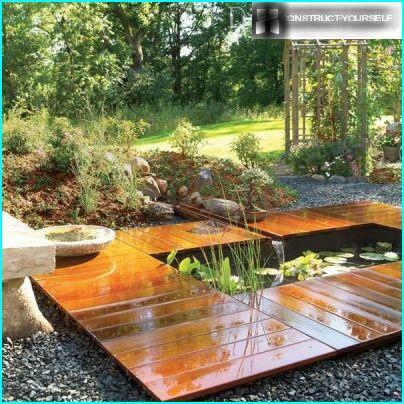 Tradition equip their homestead pondsIt came to us from the East, where water is always valued more than gold. Miniature pools with fountains regular geometric forms were mandatory attribute of any Muslim patio. In China, the development of garden culture has gone slightly different paths - the gardens were laid in the landscape style, reminiscent of the most natural look of the natural landscape. This style demanded its continuation andreservoirs that were wrong curves were quite extensive in area and always supplied with a bridge and a stone lantern in the coastal zone. Interestingly, the Chinese middle of the pond necessarily settled a tiny island in no way connected with the land, the so-called island of dreams. "Salt" of the island was impressive stone or a single tree. Japan, because of the limitations of its territory,always tended to minimize the area of ​​the garden, where a vast body of water was not always the case. However, due to the traditional concept of a Japanese garden, implying the presence of all the elements, water existed in the form Tsukubai - a small vessel with water. Obligatory attribute of this small pond was stylized stream flowing from hollow bamboo tubes, and dwarf trees along the banks. 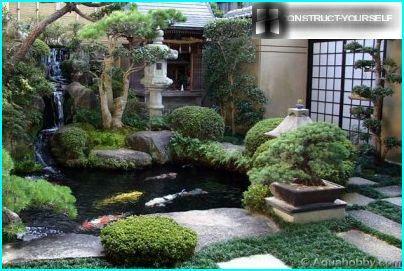 Sometimes a pond acquired square or rectangle, which further emphasized asceticism a Japanese style garden. In the future, the grain sown eastculture, gave the lush sprouting in Europe, and more specifically in England and France, where the park art gone completely opposite paths. English garden, a hair's breadth reminded Chinese and is a natural part of nature with lush vegetation and landscape ponds. French Garden is decided in the so-calledregular style, which is considered to be the crown of garden and park ensemble of Versailles. For regular garden decoration in the French style is characterized by a clear split, correct geometrical forms and bodies of water, towering above the ground. 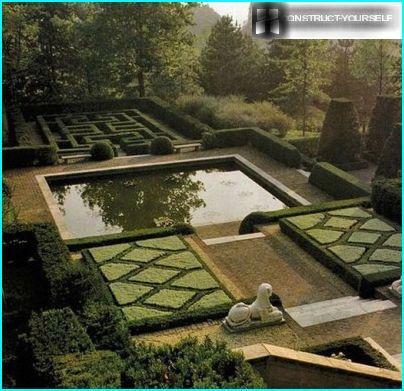 In this era of a regular garden pond acquiredthe formal name and was further developed in the avant-garde garden landscapes, where adjusted forms of the pond are combined with plastic, metal, glass in the form of unusual designs or even imitations of vegetation. As the country to make the pond so that henot worn out canvas the existing landscape and has been properly verified by style? 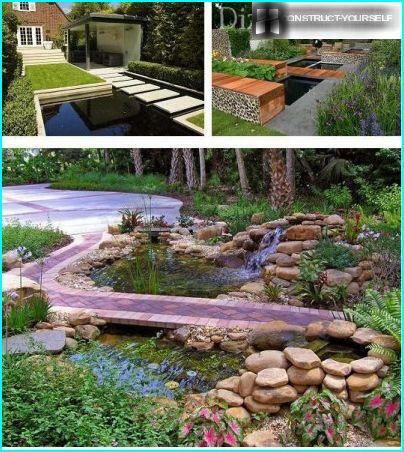 Choosing style solution to the pond on his land plot, push down on the architectural design of the country house and the existing garden breakdown. 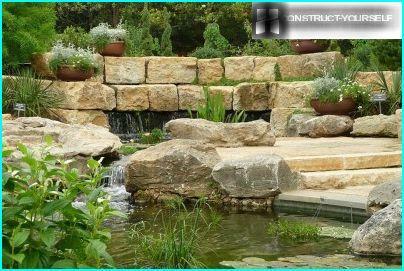 Complete the reservoir cup decorative brook or a waterfall in the form to the shoreline and make blind area of ​​tracks in the same way with the concept of the whole landscape a garden plot. Landscape the pond with the natural contours willalways appropriate in the bottom of the garden next to the gazebo on the terrace or near the house - in fact, you should be able to sit comfortably to watch the water surface. Design of the reservoir may be more constrained byJapanese principle - boulders of various sizes, conifers, the lack of multi-colored grasses. Or, in the Chinese style - a lush and bright, with the obligatory accent in the form of a tree with colorful leaves and the arched bridge. Landscape the pond can be created in the style of "natures Garden" suggests landing only native plants typical of the region, and the absence of any exotic plant. A formal pond geometric shapes - squareor rectangular configuration looks favorably next to the house, emphasizing its vertical and horizontal lines. Not bad this pond is combined with a courtyard or patio, especially if nearby or broken rectilinear beds laid Linear track. 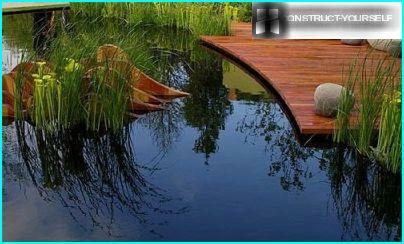 An interesting technique that is widely used inmodern landscape design - laying paths lined terrace board and spread to form a bridge across the pond sloping geometry. Such a path across the pond may also be in the form of a concrete walkway or individual square plates, as if hovering over the water. Originally look small cascades, of different size ponds, where the water flows from one bowl to another through small waterfalls. 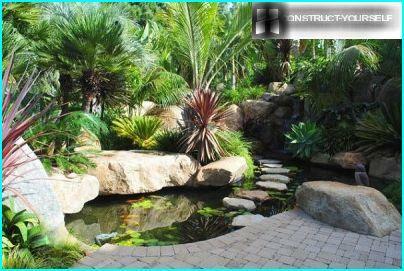 Round ponds on a par with a rectangular shapealso apply to the formal ponds and can become an ornament to the lawn or open lawn, stylistically supplement garden area with a pergola, or stay close to the picturesque group of trees. 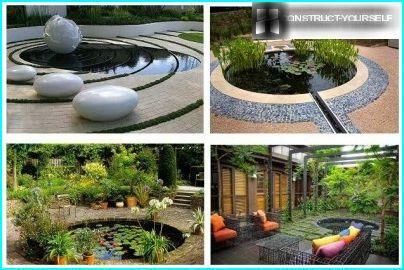 The round shape of small ponds in the garden can be made with their own hands a lot easier than any other configuration, using ready-made concrete rings, wooden tubs, plastic containers, and even tires. Choose the right place for the reservoir willkey to its long-term operation without seasonal "blooms" in spring and summer, when exposed to ultraviolet light activated green algae. A certain period of daylight pond must be in the shade to the algae is not as intensively bred. On the other hand, the placement of the reservoir fully in the shadow area will delay the development of ornamental plants. It is important to observe the golden mean. It is important to know that the pond should be covered by the sunabout 5 hours a day and be open to the southwest. 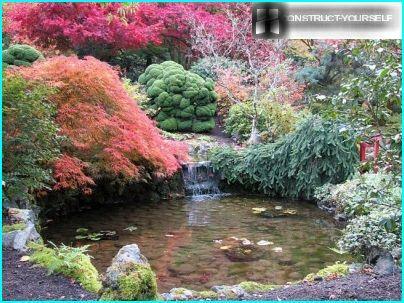 It is undesirable to have a pond under the shady trees - deciduous autumn foliage will contaminate it. As for the size of the pond, the pond IdeallyIt should take 3% of land area. When the garden is small - with a standard area of ​​6 acres, not every cottager is ready to allocate a pool of 18 m2. 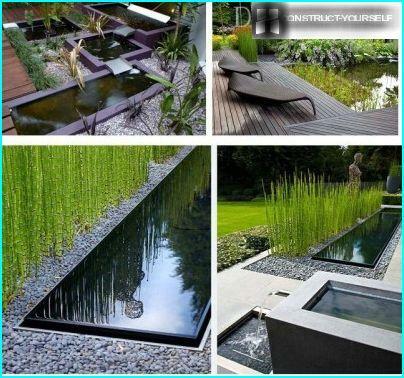 Of course, the smaller the size, the easier it is to make a pond with his hands - and materials required are not many, and labor costs will be minimal. Therefore, to determine the width and length of an artificial pond, take into account their physical abilities and harmonious perception of the pond, as the composite spot on your site - that is, as its dimensions are combined with other elements of the suburban landscape. In depth, the pond is recommended to be divided into threestage: area of ​​coastal plants, shallow area of ​​the pond queen nymph - hardy water lilies and penetration for wintering fish - if you expect them to breed. Do not make the pond too deep, you just dig a hole for winter fish depth of about 150-180 cm (below the frost line), so that it took about 1/5 of the pond area. As with the location and approximatedimensions of the pond you have decided it's time to think about what materials to use to make the pond was as easy and fast as possible. 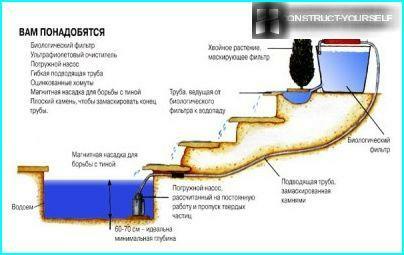 Most major and expensive option arrangement of the pond - a concrete base, requiring the construction of formwork and reinforcement. A less expensive way to lay the pond - use of the finished plastic container. 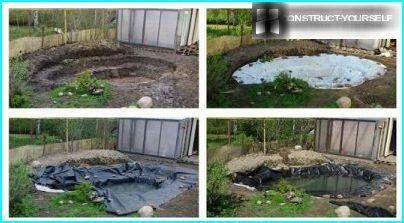 Finally, the most convenient and budgeta way to make your own hands artificial pond - the use of a special water-resistant film, which laid out a bowl of the pond. This method bookmark pond and we have the basis for a detailed description. 1. Initially, it is necessary to sketch a plan for the future of an artificial pond on a scale indicating the depth and width of curtains (shelves under the planter), and it is desirable to draw a rough sketch of the decoration of the reservoir. Such an approach will help avoid various alterations during the construction of the pond and landing on the stage of the plant. At this stage, think over, which will focus in the composition of your lakes - this may be the original stone, wood, or sculpture. 2. Using ordinary tap or hose spilling sand on the perimeter of the reservoir in the form of a line, draw a prospective outline of the pond. Be sure to check that your future lake shore were in the same level. Periodic checks should be the level of the pond shoresduring the formation of the pit. If you do not have a water level of the desired length, it is possible to adapt the conventional long board and install it on a small 50-centimeter-level. 3. Getting earthworks - tearing pit on coastal tier depth and mark up the line from which the pond is deepened to the next mark. After receiving the second tier, paving the line for digging the deepest part of the pond and take out the last portion of the land. The process of digging out the pond is heavy enough,therefore it is better to hire the services of professionals in ground works, accompanied by a mini-excavator. However, if you still decided to perform this tedious part of yourself, be prepared for the fact that at the bottom of the well water can collect and you have to tinker in the dirty slush. Harvesting water from the bottom of the pit will help pump specially adapted to pump water with impurities and solids. Nearby you can dig a hole and drop the auxiliary water into it. 4. Once fully excavated pit, with a cord measure its dimensions given depth by adding allowances of about 50 cm on the sides of the bowl - is required to obtain the desired size of the film. The problem that you will inevitably encounter inExcavation - is what to do with the earth excavated from the pit by the pond? A nice way of solving this problem - to raise the level of plot, distributed evenly on the soil of gardens. You can also use the pit land as the embankment to a stream or as the basis for the alpine slide. 5. 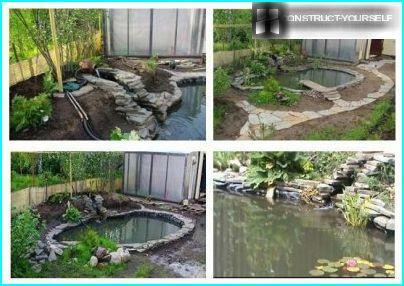 Bowl pond lined with durable water resistant film. As a general rule, in order to protect the base film from being damaged with stones and roots of plants, under it is put an extra layer of geotextile. 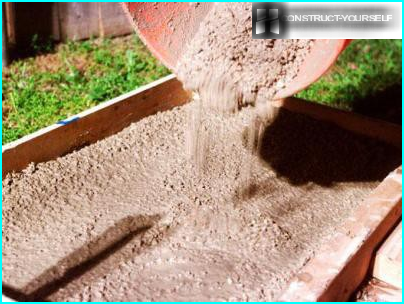 For this purpose, also fit the old linoleum flooring or roofing, or you can simply fill the hole with sand and tamp it. In order for the film of the pond has become more flexible, for its styling is best to choose a sunny day - then it warms up a bit and it will be better to stretch, easily bypassing all the benches of the pit. 6. For the arrangement of the pond's edge, around its perimeter sees auxiliary trench - to tuck and secure with tape. Having laid the edge of the film into the trench, sprinkle it with gravel - so it is securely locked. 7. 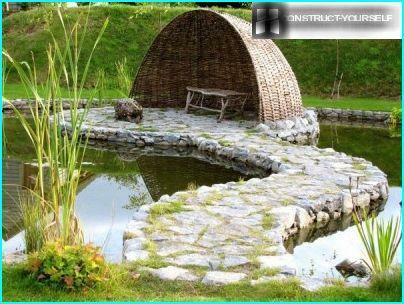 Secure the pond edge of the stone blocks or plastic pipes, nailed to stakes - so you will prevent the shedding of the land to the coastal zone in the bowl of the pond. 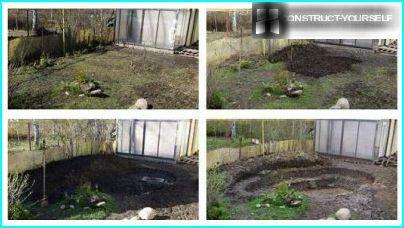 Put the edge of a natural stone and decorate a beautiful lonely clump or group of boulders. 8. 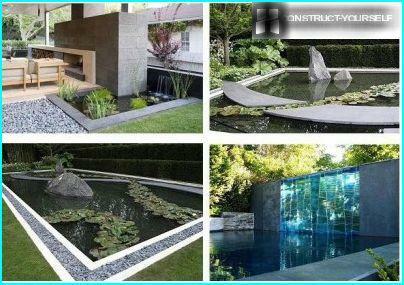 Place the prepared plants in special plastic containers and place them in the curtain, put the bottom of the pond with stones and rubble. 9. 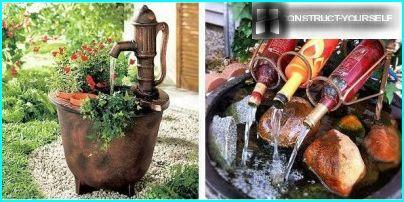 Now you can pour into the pond water. To make it easier to pick up the pump equipment and volumes of hydrochemistry in the future to take care of the pond, not too lazy to remove the water meter readings before and after the filling of the reservoir. 10. That water does not stagnate in the pond, it is better to arrange a pond creek - it will provide constant water circulation. 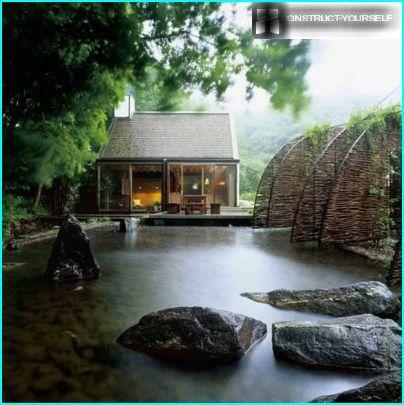 To this end, the source of the stream rises above the level of the pond, and the water will be supplied to it from the bowl of the pond using a submersible pump. 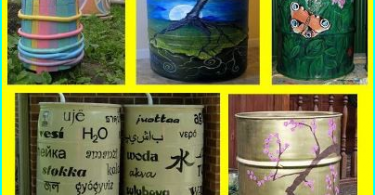 Be sure to consider how to decorate the mouth of the creek - use stones, vegetable planting, clay or glass containers. eleven. Set at the bottom of the pond submersible pump, pull the tube to the source of the stream and connect them to the filter for water purification. Cleaning Filter is better to take the pressure (reverse cleaning system) - it is more efficient flow. 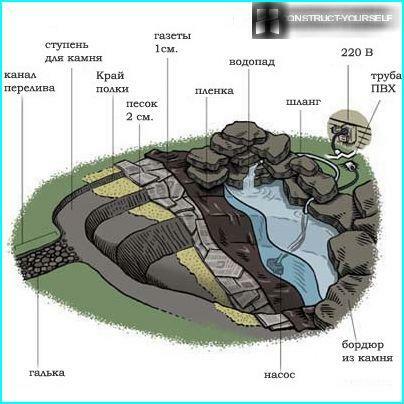 Your pond is ready, now we need a carefullyto care for him - cleaned of dirt, sometimes used prophylactic agents for the revitalization of the water and prevent the spread of the algae, and in winter take the plant in the house basement. Making the shores of the pond pellets of the same diameter, making the pond becomes somewhat dull appearance. 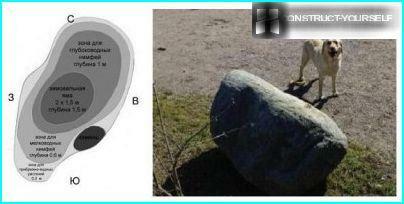 Large stones are best combined with smaller but not overwhelm them the entire coastal zone of the reservoir. The ponds are dug very deep, havesteep walls and resemble a sort of stone bag. A small investigation revealed that the companies benefit from excavation to dig deep ponds, because they pay the amount of land taken out of cubes. Pay attention to the depth of your pond - not worth it to do too recessed, especially if you are not supposed to fish farming. Craving for container gardening, whichIt interferes with the normal development of plants, and the fear of filling the pond land for planting. On the one hand, container planting allows you to quickly change the floral design of the pond by rearranging and regrouping plants. Probably growers are also afraid of the prospect of dirty pond after filling the form of land, but there is nothing to be afraid of - the ground for aquatic plants is a heavy mixture with a large content of clay, which is not washed with water, and eventually reinforcing the plant root system. 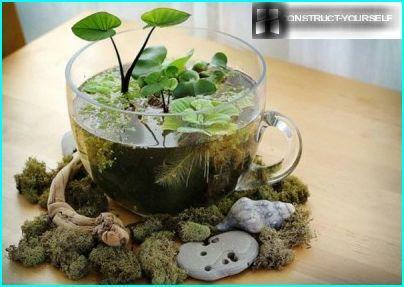 Having decided the creation of a pond with their hands, do not forget that it is not easy - work out at first, forming a miniature pond at home. If possible, safely proceed to a large-scale project on the pond full tab at their summer cottage. We are sure - you can do it!